Be advised: Inviting Friends is now easier and more convenient than ever before! 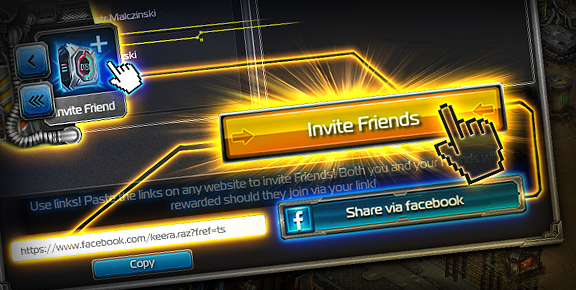 Effective immediately, Commanders are authorized to use Links to invite Friends! Click on the “Share via Facebook” button. Paste the Links on any website, and both you and your Friends will be richly rewarded! Great Commanders need great allies! Get your Friends to join the game and fight together to prove your superiority! This page was last modified on 12 November 2014, at 16:34.